Spend time with your family by planning a world-class vacation in New York’s Adirondack and the Catskill Mountains. Ski, swim and play in the natural, rustic beauty. We’ve compiled our top resorts featuring some of the best family-friendly resorts in New York. Families with children, both young and old, are bound to enjoy themselves. Kick back and enjoy summer in the mountains. A perfect getaway for active families, the Rocking Horse Resort in Highland, New York offers an action-packed vacation for young and old. The perfect spot for both indoor and outdoor family activities, the Rocking Horse Resort is an all-inclusive resort north of Manhattan. Dine on three all-you-can-eat meals daily created by culinary expert Chef Michael Hoysardt. Looking for adventure? Enjoy the Big Splash indoor water park, open year-round, featuring a 230 ft. slide and water walk challenge. Great summertime activities include a climbing wall and a brand new bungee jumper. During winter, the resort owns a private winter park which includes a ski area, ice skating and horse drawn sleigh rides. Make sure to check out the Fun Barn with its foam factory, climbing wall and bounce structure! For some rest and relaxation send the kids to the children’s day camp, where they participate in supervised sports and games, while you unwind at the massage and facial center. The resort offers nightly entertainment including wild-west shows, circus shows and a bonfire where families participate in sing-a-longs and marshmallow roasts. Looking for the ultimate family adventure? Look no further than the Rocking Horse Ranch, a perfect family getaway in New York. From New York City, take NYS Thruway Exit 18 (I-87 New Paltz exit) Turn right on to Route 299, drive 2.5 miles, take a right onto New Paltz Road; after 3/4 mile, take a right onto Pancake Hollow Road. Follow as it winds for 3.5 miles to Rocking Horse Ranch Resort. Pack up the whole family and come celebrate 40 years at Villa Roma! Located in New York’s Catskill Mountains, Villa Roma offers an all-inclusive Catskills experience. People of all ages enjoy Villa Roma, one of New York’s greatest family-friendly resorts. Kids have their own ideas about vacation and Villa Roma offers Children’s Programs for toddlers, young kids and teens! Kids enjoy scavenger hunts, ice cream parties and storytelling hour. Adults enjoy an eight-lane bowling alley, two tennis courts and an 18-hole championship golf course. Spend the day at Villa Roma’s ski area featuring ice skating, two slopes with chair lifts, a tube run and plenty of snow! Breakfasts and dinners, included in the all-inclusive packages, are served in the main dining room. The resort offers six on-site dining venues ranging from classic fine dining to casual cafes. At night, enjoy live entertainment at Club Forum, dance to the DJ at Marty’s Lounge or grab a drink at the Mezzanine Piano Bar’s outdoor patio. Enjoy a true Catskills experience. Vacation at Villa Roma, a family-friendly resort offering great entertainment for all ages. Check out the resort’s Spring/Summer theme weekends as well as their fantastic family fun weekends special! From New York & Metropolitan area, take the George Washington Bridge to New Jersey Palisades Parkway to New York Thruway North. Proceed on Thruway to Exit 16 and proceed west on Route 17 to Exit 104. Take Route 17B (Raceway Road). Go West to Cochecton 17 miles, at the blinking light turn right at the intersection on Route 17B West and 52A, then follow the signs to the Villa Roma. The Mohonk Mountain House is a classic Hudson Valley resort. A majestic Victorian castle 90 minutes north of New York City, the resort is one of America’s oldest family-owned resorts. Located on the banks of Lake Mohonk, the “Lake in the Sky”, the Mohonk Mountain House offers activities and adventure for the whole family! Lake Mohonk is truly magnificent, slightly hidden at the top of the Shawangunk Ridge. Rock formations rising from the water frame the Victorian-style resort forming an elegant mystique. With over 85 miles of hiking and biking trails, families enjoy an authentic Hudson Valley vacation. Activities include weekend carriage rides, snowshoeing, and a Kid’s Program. Tour the award-winning Show Gardens or get lost in the Victorian Maze. On weekends, rock climb at Skytop with an authorized guide from Alpine Endeavors. Your getaway includes three daily meals featuring modern American cuisine using ingredients indigenous to the region. Try the resort’s daily lunch at the Granary or grab a quick snack and drink at the Carriage Lounge. At night, delight in roasted s’mores, dancing and more! For family fun, plan your next getaway to the Mohonk Mountain House. Your family will feel like royalty staying at this Victorian castle! Situated in the heart of the Olympic Village in Lake Placid and on the shores of Mirror Lake lies the Golden Arrow Lakeside Resort. This green and sustainable resort is the only one in the United States to have received the Audubon Society’s 5 Green Leaf Eco Rating for Hotels. A year-round resort, the Golden Arrow Lakeside Resort offers a memorable Adirondacks experience. The resort features a white sand beach and provides canoes, kayaks and paddle boats. Fish for trout and perch in Mirror Lake. In winter, ice skate, dog sled or spend the day skiing at Whiteface Mountain. At the end of the day, relax in the heated indoor pool. The Golden Arrow has the only Kidz Activity program in Lake Placid – a daily dose of arts &amp;amp; crafts, games, contests and more. The resort also has Kids Night Inn where kids indulge in pizza, movies and no parents. Grab a bite at Generations Restaurant, take a gondola ride on Mirror Lake or dance at Roomers Nightclub. Perfect for family togetherness as well as some quality time without the kids make the Golden Arrow Lakeside Resort your next family getaway! Stone Fence Resort, surrounded by thousands of feet of meticulously manicured stone fence, offers a lush natural atmosphere just outside the city of Ogdensburg, New York. Choose your lodging from the spacious and elegant Shoreside Hotel, a modern log cabin with townhouse and family units, or motel-style accommodations. Take a boat tour and witness a St. Lawrence River sunset, visit Singer Castle on Dark Island, and explore the St. Lawrence--its wildlife, history, and development. Whether you came for the tours or the scenic views, this is the resort for you! Pack the kids in car and head north to the banks of the St. Lawrence River in Central New York! The area activities are endless: boating, canoeing, fishing, tennis, basketball, swimming, and much more! Book a suite equipped with a Jacuzzi and balcony. The kids are going to love the outdoor pool and game room! Stone Fence Resort gets a lot of guests on their way to and from Akwesasne Mohawk Casino. After a day of collecting memories at Stone Fence, head on up to Akwesasne to test your luck. The casino has over 1,600 slots, 26 table games, including blackjack, roulette, and poker. The town was a strategic location during the War of 1812. Ogdensburg was attacked in 1813 and suffered severe casualties. City government was adopted in 1868 when the village was known as "The Maple City." Find four seasons of family fun at Fairway Suites At Peek'n Peak Resort, where every month offers up a world of vacations for every age! No matter the season, there's a reason to visit this family fun center. When the summer sun is shining, tee it up on the resort's Lower Golf Course, head to Lake Erie Speedway, or enjoy a myriad of in-town shopping and dining options. Once the winter wonderland arrives, ski the powder-blanketed hills of the nearby ski resorts, set off on a snowmobiling expedition, or sip hot chocolate in your cozy room. Featuring one- to three-bedroom condos adjacent to the ski slopes and the golf course, your family is just footsteps from the fun. And, amenities like flat-screen televisions, private balconies, and free Wi-Fi make your family feel at home. A host of family-friendly activities, welcoming accommodations, and an unbeatable location make Fairway Suites your year-round New York vacation destination. Every season truly is "peak" season at this resort! Winter vacationers will love the resort's 27 groomed slopes, miles of cross-country trails, snowboarding, snow tubing, and equipment sales and rentals. The grass is always greener when you're golfing here. The Lower Course has earned a 3 ½ star rating from Golf Digest magazine, while the Upper Course offers a challenging layout and has been a past host of the PGA Nationwide Tournament. Bring the whole family to explore the tranquil beauty of the Thousand Islands and revel in the historic charm of the surrounding region at the Riveredge Resort. Built on steamboat wharf, Riveredge Resort enjoys water vistas on the three sides so you’ll always have a room with a view. You and your family can choose from two rooms, the Standard Water View Rooms, which offer two different views: marina view and bay view, and Castle View Rooms, which features views directly overlooking Boldt Castle and Heart Island from a private balcony. You can also choose from two suites, Loft Suites, Water View, which are located on the fourth floor and are bi-level accommodations, and Jacuzzi Suites, which includes a Jacuzzi in the bedroom. There are plenty of activities to entertain the whole family. Kids and adults alike will enjoy the game room, featuring arcade games and a foosball table, and the indoor and outdoor pools, as well as the hot tub and sauna. At Riveredge, a 2,000-foot dock opens up a heaven for boaters on the St. Lawrence Seaway. Make sure you and your family explore the waters of the river during your stay at Riveredge. Make sure to explore the international seaway locks, castles, museums, and historic villages in the area. Check out these on-site restaurants offered by Riveredge: Windows On The Bay, River Watch Lounge, and Seasonal Poolside Tiki Bar. Explore Mother Nature with your entire family when you visit the Leatherstocking region of New York. Find the perfect recreational activity for your loved ones and enjoy your vacation together. It's easier to reconnect with your loved ones when you stay at August Lodge. Their cozy rooms and suites make you feel at home. Their modern amenities make your stay unforgettable. Relax by the swimming pool and watch your little ones make a splash. Whenever you're ready, venture outdoors and explore the Susquehanna Valley! Plenty of hiking trails, orchards, and fishing opportunities await. Or if you prefer, visit any of the local museums, go on a horseback ride or simply have a picnic with a view. Make lasting family memories in upstate New York! Fishing enthusiasts will enjoy casting their line on Susquehanna River! Inquire today and enjoy an exciting fishing destination only with August Lodge Cooperstown. After a day exploring the Susquehanna Valley, rejuvenate with a full body massage right onsite! Depe Dene Resort offers a four-season getaway for families along the shores of the beautiful Lake George with the breathtaking views of Adirondack Mountains! With its own private beach, Depe Dene Resort boasts over 700 feet of shoreline for sandcastle building, swimming, and fishing. With 36 species of fish in the Lake George watershed, you'll have a great chance to reel in your next trophy catch when you plan your trip to The Depe Dene Resort! Old Forge Camping Resort is host to over 400 sites set on 130 acres in the heart of the Adirondack Mountains. This campground is the ideal year-round getaway for the entire family! 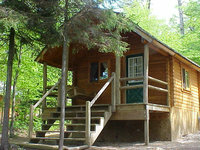 Choose from one of their log cabins, cottages, or bring your RV or tent. Old Forge Camping Resort is the family-fun vacation you've been looking for! With a prime location in the Adirondacks, you'll find a multitude of activities for the whole family. Start off at Enchanted Forest or Calypso's Cove for fun thrills and entertainment, or take it easy with an afternoon of fishing and swimming on the private lake! 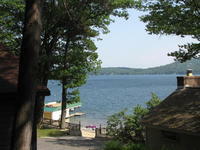 The private Lake Serene offers a beautiful setting for your Adirondacks lake getaway. Stay at Old Forge Camping Resort and spend your days on the water: paddle boats, rowboats, canoes and more are available to rent onsite! Build a sandcastle, lounge under the sun, or enjoy a picnic with the family! Old Forge Camping Resort offers free shuttle rides to Enchanted Forest/Water Safari located just next door! Located on the shores of Lake George, The Georgian Resort and Conference Center provides great Adirondacks entertainment. Within walking distance to the shops in downtown Lake George Village and close by several attractions, this resort is a great family getaway. Family vacations in the Adirondacks never seemed so fun! Featuring a heated swimming pool and patio, a private beach and a dock area, The Georgian Resort is an elegant, four-season resort. Kayaks and paddle boats available for rental. Local attractions found off-site are the Great Escape Six Flags Amusement Park, Water Slide World and more! Shoppers are sure to enjoy the Million Dollar Half Mile Outlet Center just a short drive from The Georgian. For ski lovers, both West and Gore Mountains are a short drive away. Dine at Giovanna’s on the Lake or enjoy a quick lunch at the Boca Bar which overlooks Lake George poolside. At night, mix dining with entertainment at the Dinner Theater which features a rotating national cast. Overlooking beautiful Lake George and offering stunning views of the Adirondacks Mountains, The Georgian Resort and Conference Center is a wonderfully secluded family getaway. Learn more about the resort’s great specials and packages! The #9 resort on our Top 10 is considered a Lake Placid landmark. Just steps away from the pristine Mirror Lake, Hotel North Woods offers a historic escape right on Main Street. Surrounded by the breathtaking Adirondack Mountains, it's the ideal destination for family vacations any time of the year. Hotel North Woods presents a comfortable stay during your exciting New York vacation. Families love the year-round opportunities available in the area and the taste of luxury that Northwoods provides for the length of their stay. Lake Placid offers endless outdoor opportunities including watersports, mountain activities and more. Mirror Lake is ideal for taking the kids on their first fishing trip, or for a relaxing picnic on the shore with all your favorites. Take a boat tour and enjoy all the beautiful views, but don't forget to head out and experience it, too! The Adirondack Mountains provides the perfect setting for a nature hike, mountain biking, and horseback riding. The kids will love riding through the calming trails! The Inn's all-suite rooms feature modern amenities to ensure your comfort, and their two restaurants make it easy to dine right onsite. Main Street offers a break from the thrill with relaxing shopping and sightseeing trips! With all these possibilities, and a whole lot more, what are you waiting for? Hotel North Woods is the answer to your Adirondacks family vacation! Enjoy a meal and more at the onsite Northern Exposure, The Pavilion, and The Cabin restaurants! Family fun comes fast at Darien Lake Resort, where a thrilling amusement park, a splash-tacular water park, and luxurious lodgings provide adventures for all ages! Start your Darien Lake Resort stay with a scream at the amusement park, which features towering roller coasters, exciting children's rides, and water attractions. Speaking of water, aquatic adventures abound at the water park, which is teeming with slippery slides, lazy rivers, and exciting tube rides. Dry off in a guest house, lodge, or cabin. These accommodating lodgings feature such amenities as gas grills, air conditioning, cable television, and private porches. For some off-property fun, head to Niagara Falls and stare in awe of the cascading water! This resort truly provides excitement for every member of the family. Experience wild rides, water-fueled fun, and a host of amenities! Opening day features the exciting "Ignite the Night" show, a stunning laser and pyrotechnics display! Partnering up with Live Nation, the resort offers a collection of exciting musical concerts throughout the summer! Make your next New York family getaway an Equestrian-themed trip when you plan it at B & B Ranch in Fly Creek. The Ranch happily accepts all ages and skill levels to join in the fun! With miles and miles of trails, indoor and outdoor arenas, and lots of room to run, there's plenty of places to enjoy a horseback adventure during your B & B vacation. You can come and ride for the day if you're staying in the area, or plan an overnight stay that includes breakfast and an unforgettable five-course dinner. If "horsing around" isn't for you, spend a day doing laps in the swimming pool, or just take a soak in the hot tub. The luxury inn accommodations, five unmatched guest suites, offer a truly remarkable getaway as they are all uniquely outfitted to complement guests, their comfort and their personal tastes. Fireplace, flat screen televisions, and more add to the special ambiance this property holds. Give your family an unforgettable experience at B & B Ranch! B & B Ranch members get exclusive access to farm-fresh butcher's cuts by post. Un-rivaled Butcher Boxes ship out monthly by subscription - and they're loaded. Subscribers choose between seven or 14 pound deliveries and every month they get more than enough for another month of the Ranch's great food. B & B Ranch caters to a range of riding disciplines including: Hunt Seat, Dressage, Eventing, Western Horsemanship & Reining, and Pleasure Riding. To get a sense of what to expect at Timberlock, one only has to look to their website. There you'll find this: "Timberlock is more than just a vacation. It is an experience." This rustic resort in scenic Indian Lake is ideal for any and all occasions! Whether you're inside your impeccably furnished cabin or strolling along the magnificent lakeside setting, your days will be filled with tranquility or fun, whichever you require. This is one of the oldest summer family resorts in the Adirondacks, and has maintained their peaceful setting throughout the years. Timberlock is surrounded in all directions by miles of New York state forest preserve. Bike rides and hikes alike are superb ways to enjoy it! But as luxurious as it seems, Timberlock maintains that they're not a luxury resort. Instead, they want to focus on the basics- namely your health, comfort, and experience. Cannonball off the dock and into an unforgettable family weekend at Timberlock! Cabins are heated with wood stoves and lit with gas lamps to give a true rustic feel! There are no permanent stop lights in town! North Mountain makes for a towering and beautiful backdrop for an Inn. 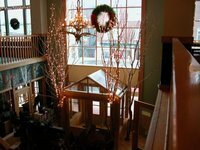 That Inn is the Winter Clove Inn, where your family will make unforgettable memories. Follow the rolling foot hills of the Catskills and eventually you'll stumble upon one of New York's hidden treasures: Winter Clove. Offering fresh mountain air, friendly hospitality, and pristine natural beauty and a totally affordable price, few Inn's can claim to match the level of experience Winter Clove can. As an all-inclusive resort, a stay here will put your mind at ease, allowing you to focus on making memories with your family! The lodge provides three delicious meals per day, a heated indoor and outdoor pool, and so much more. Let Winter Clove show you just how spectacular the Catskills can be! Whether it's summer or winter, you'll enjoy miles of hiking, mountain biking and cross country skiing trails, and complimentary cross country ski equipment! There's also a nine-hole complimentary golf course. Pine Ridge Dude Ranch in Kerhonkson, New York is an all-inclusive, affordable family vacation destination. Being only 90 minutes from New York City, Pine Ridge is perfect for a weekend getaway. Set in the beautiful foothills of the spectacular Catskill Mountains, Pine Ridge offers stunning mountain views, as well as spacious and cozy accommodations. Their Western horses ride over miles of wooded trails that overlook the scenic Shawangunk Ridge with views of the Mohonk Mountain. For safety of all the riders, each trail ride is accompanied by several experienced wranglers. The heart of the ranch is their unique approach to horses for both riders and non-riders. They give their guests the opportunity to ride all day or just enjoy watching the horses in the field. Pine Ridge offers a first-class riding program at affordable rates and features trail rides for riders of all levels, including beginner, intermediate, and advanced. Pine Ridge makes sure to accommodate the younger horse-lovers, offering one free pony ride per day for children six and under, corral lessons for kids ages five to eight, and a Barn Buddies program. With their Barn Buddies program, kids can get real hands-on experience by learning about what horses eat, how to groom them, how to saddle them, and of course how to clean up after them! Pine Ridge doesn’t just have horses, the resort also features tractor rides, paintball, an indoor and outdoor pool, a petting zoo, and much more!